Some say that the Flower Girl is symbolic of the bride’s journey from a girl into adulthood or womanhood. The innocence of a child, young, angelic wearing white, dressed similar to the bride, symbolizes purity. Tradition has this young lady taking the journey down the aisle before the bride, toting a basket of flower petals. In the past the flower petals would pave the way for the bride from her childhood home to the church where she would marry her betrothed…yes, she walked! It wouldn’t be unusual for one of the flower girls to carry garlic as that was believed to ward off evil spirits from the ceremony. Also popular were grains or sheaves of wheat which was symbolic of fertility. Let us not forget the floral wreath or hoop. The circle is suggestive of the circle of the wedding band; it has no beginning and no end, significant of infinite love. Brides may step away from tradition to have their flower girls carry a wand with something sparkly at the end or colorful satin ribbons. Creativity rules, there are no rules!! Some suggestions may include, umbrellas, balloons, pinwheels or bubbles. Have fun with it and they will too! 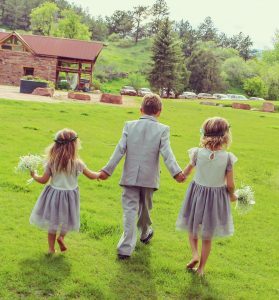 Present day brides may have their flower girl in a miniature version of the bridesmaid dress or the always popular white, too cute, dress with a color sash to match her maids. All girls love accessories, little girls and big girls too. Again, step out of the box, run with the idea of princess crowns and fairy wings for this little cutie! Springtime greenery and florals woven through her hair or have her adorned as a tiny woodland fairy with a crown of flowers. Let her be the ballerina she dreams of in sweet little ballet shoes and tulle skirt or your color themed version of Dorothy’s ruby slippers. If your ceremony celebrates the chill of winter, let her wear or carry something cozy or made of faux fur. Just like the grown-ups, cowboy boots, maybe in pink, glittery, sparkly converse shoes! You can choose to have more than one flower girl! The Royal family would have flower girls, plural, which would come in handy with all these things that needed to accompany the bride on her trip down the aisle! Current day brides usually have one special little girl to wow the crowd. She will no doubt be adorable and will steal the show! It will go one of two ways, cuteness overload or crying. Either there will be “Oohs and Aahs” from the guests as she flashes that cute little smile while carrying out her flower girl duties…OR there will be tears! I guess you have to expect there to be some shyness, after all, she is young and not used to having all those strangers’ eyes on her. If your flower girl refuses to walk (or run crying) down the aisle, you can have a parent “transport” her from point A to B You may want to try to lay the ground work ahead of time by bribing her… did I say bribe!? What I meant to say was use the time leading up to the wedding to get her to warm up to the idea. Give her a special little gift from you and the groom. Let her know how happy you both are that she will be joining your select group. Tell her how important her role is and that she is the perfect little girl for it! Maybe include her in a luncheon with your bridesmaids so she can meet and spend a little time bonding with them. When your wedding day arrives she will be happy to see familiar faces. At the ceremony, let her mom and dad sit close to the front of the room so she can clearly see who she will be walking towards! Who says walking or running is the only means for your littles to make it down the aisle. Think decorated wagon or tricycle! Grooms name, here comes your bride! Too late to run cause here she comes!